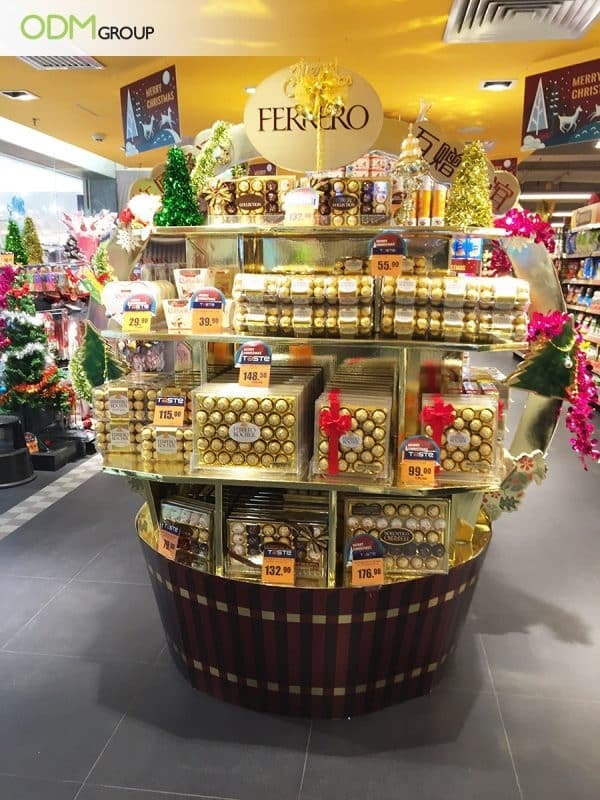 Ferrero understand the value of a holiday POS display for enhancing sales around the Christmas and New Years period. The luxury chocolate brand have made many extravagant holiday POS displays in the past. It makes sense that Ferrero would focus on holiday marketing ideas around this time as 61% of their annual sales occur in the last three months of the year. What makes this holiday POS display stand out? Design: This holiday POS display is shaped like the iconic treat. Images of a holly plant and Christmas tree on either side are a nice subtle nod to the holiday period. 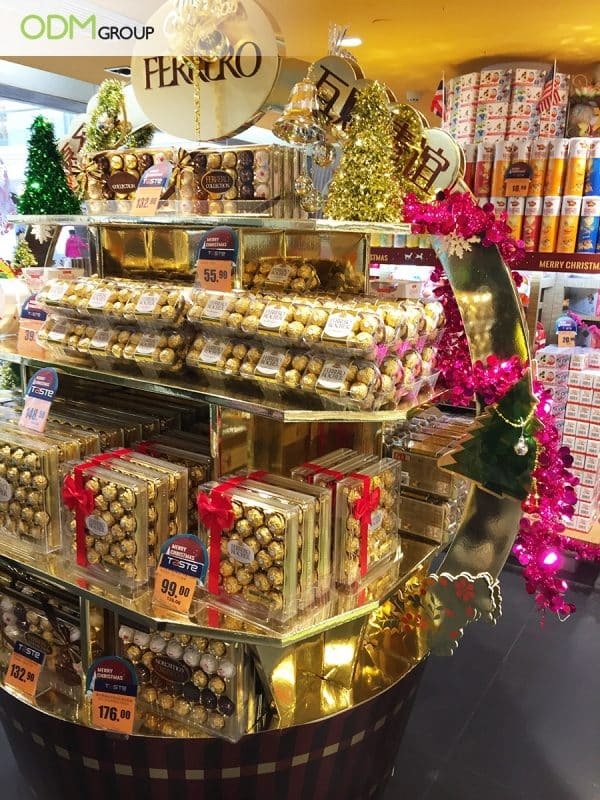 Size: Ferrero’s holiday POS display is large enough to show the brand’s entire line of chocolates. This POS display does not focus on any one item in particular. Instead, it presents customers with many options. Positioning: Ferrero put this chocolate POS display close to the entrance in the store we spotted this display in. The chocolate aisle was on the other side of the store. Here shoppers would have been presented with other items that they may have bought instead. This is a good example of strategic positioning of a POS display. Relevance: The holiday POS is amongst decorations. This is effective as it appeals to customers doing Christmas shopping. This encourages customers to view Ferrero chocolates as a gift instead of a grocery item. As a result, customers are happier to pay a premium price. Cost-effective: This cardboard POS display can easily ship this as a flatpack for staff to assemble in store. What could Ferrero improve about this display? Presentation: The store has put a ‘Merry Christmas’ sign right in the middle of the large Ferrero logo. Obscuring the logo like this can hinder brand recognition. The decorations placed to the side of the holiday POS display detract from Ferrero’s sophisticated brand image. It is important to check that retailers are correctly assembling and maintaining store displays. Placement: Arranging the products in a streamlined way would benefit the overall ‘look’ of this holiday POS display. Moreover, centring large products and placing small items above and to the side would likely look better. ODM can design and produce a POS display which will ensure your brand stands out above the rest. Feel free to make a query today! The display is unique and links to the images seen in Ferrero ads. This holiday POS display has been made to reflect Chinese New Year customs. This heart arrangement would also be a great way to promote Ferrero as a Valentines Day gift. This case study explores what Ferrero does differently to other brands. This gift encourages customers to enjoy a Ferrero as a treat with coffee.